Team(4-1-4-1) – De Bie(C), Hinds, Statham, Walcott, Reynolds, Bowden, Pochettino(Lloyd-Bennett 70), P. Maghoma, Patterson(A.Shashoua 80), Mukendi(Clarke 62), Griffiths. Unused Subs. - Freeman, Richards. Scorers – Pochettino 6, Patterson 27, Griffiths 42, 90+4, P. Maghoma 45+2. Booked – Griffiths 65, Clarke 90, Reynolds 90. Spurs' second game was away at Arsenal on the 25th. This turned into a nightmare for the young Spurs side who started with Walcott and Lloyd-Bennett. The hosts were too good and were four goals up before the break with hardly an effort by Spurs. Scott Parker made changes for the second half but conceded another two goals before the Gooners sat back and allowed Spurs time on the ball.Spurs had a couple of efforts saved and one cleared off the line but were second best to a side that did not play in Europe midweek. Team(4-1-4-1) – De Bie(C), Hinds, Statham, Walcott(Pochettino 46), Lyons-Foster, P.Maghoma, Patterson, Clarke(A.Shashoua 46), Reynolds, Lloyd-Bennett(Richards 57), Griffiths. Unused Subs. - Oluwayemi, Bowden. Booked – Maghoma 45, Pochettino 58. Spurs' second group game was against Villarreal at Stevenage on the 14th. The Spaniards had won both their group matches to top the group completing the clean sweep with a 2-0 win over Spurs. From the start they dominated the game drawing early saves from Whiteman, hitting the post and having an effort cleared off the line before finally breaking the deadlock with a good opening goal. They got the second at the end of the first half. Spurs made a double change after the hour mark and got more into the game, but Villarreal were comfortable enough to play out the final minutes with ten men which became nine when three red cards were shown at the end. Bennetts got one for Spurs and two went to the Spaniards. The second was to the player that went off earlier. I assume for entering the field of play without permission. Team(4-1-3-2) – Whiteman, Marsh, Maghoma, Lyons-Foster, Bennetts, Skipp, Roles(Tracey 62), Pritchard(C), Shashoua(Hinds 62), Sterling, Harrison(Loft 80). Unused Subs – Austin, Reynolds. Sent Off – Bennetts 90+9. Spurs' fourth game was the return fixture against Real Madrid. This game was more even than the first which was a game of two halves. The sides were evenly matched with Madrid more open to shooting than Spurs who wanted to play through to goal. Madrid opened the scoring with a low drive. Spurs drew level from a corner with a Tanganga header. The pace quicken in the second half after Spurs won a penalty a minute in. Having won a free kick on the edge of the area Sterling won a penalty from the quickly taken kick by Roles. Edwards scored from the spot and Madrid pushed for an equaliser. They got it with another low finish. Both sides went for the win which Spurs got when Edwards slipped Sterling in to beat the keeper. Spurs closed out the game and could have got another when Maghoma tried to catch the keeper off his line from 75yds. The 3-2 win sets up a top of the table clash with Dortmund next. Team(4-2-3-1) – Austin, Eyoma, Tanganga, Lyons-Foster, Bennetts, Marsh, Skipp, Roles(Hinds 74), Edwards(C)(P.Maghoma 88), Shashoua, Sterling(Griffiths 90+3). Unused Subs. - De Bie, Bowden, Patterson, Reynolds. Scorers – Tanganga 26, Edwards pen.47, Sterling 74. Booked – Roles 34, Sterling, Maghoma. Spurs' fifth round game was away to leaders Borussia Dortmund on the 21st. This turned out to be a bit of a stroll in the park as Spurs took control early and opened a two goal lead when Shashoua came inside to meet Edwards square ball for the first and then worked the ball down the left to pull it back for Brown, who started the move, to score at the near post. Skipp had struck the bar between the goals. There was a blip when Austin failed to hold a shot that went in and Edwards failed to convert a penalty he won. But Spurs sealed it with a third goal before halftime when Shashoua played in Sterling to score. Dortmund tried to get in the game in the second half but once Spurs regained control they saw out the game with ease. The ref spoiled it by booking two players for timewasting when the game was over as a competition. Team(4-2-3-1) – Austin, Eyoma(Hinds 84), Tanganga, Lyons-Forster, Brown, Skipp, Marsh, Edwards(C)(Roles 72), P. Maghoma, S. Shashoua(Bowden 89), Sterling. Unused Subs. - De Bie, Reynolds, Griffiths, Richards. Scorers – Shashoua 6, Brown 17, Sterling 43. Booked – Tanganga 84, Austin 90+3. After five games Spurs top the group with 10 points above Dortmund on 9. The first game of the month was a London derby against Chelsea at Hotspur Way on the 18th. The visitors were quick off the mark putting the Spurs defence under pressure scoring early from a short corner. Spurs equalised when Edwards played Harrison through to hold off the last defender and score. The rest of the half was more even with chances at both ends. Chelsea went in front again early in the second and held the lead going into added time when Whiteman was penalised coming off his line. They scored from the penalty but Spurs pulled a goal back when Sterling headed in Marsh's cross but it was too late to prevent the blues running out 3-2 winners. The match will be remembered for the first appearance of Erik Lamela after his long injury layoff. He was given an hour and looked to be fit again – he did not over do anything as it was to look at his fitness. Team(4-1-4-1) – Whiteman, Marsh, Tanganga, Lyons-Foster, Bennetts(Maghoma 63), Skipp, Edwards(Sterling 75), Amos(C), Lamela(Pritchard 60),Tracey, Harrison, Sterling(Tracey 80). Unused Subs. - Austin, Loft. Scorers – Harrison 11, Sterling 90+4. Booked – Pritchard 62, Whiteman 90+1. The second game was a trip to Manchester City on the 25th.Most of the squad that played Dortmund played in an open game that finished 4-2 to the hosts. Spurs took a two goal lead before being overhauled. Harrison scored the first with a free kick after Pritchard had been fouled 25yds. Out. The second was six minutes later when a Free kick by Pritchard was headed back across goal by Maghoma for Sterling to head home. City pulled a goal back through U-17 world Cup star Foden before the break and were leave ten minutes after. 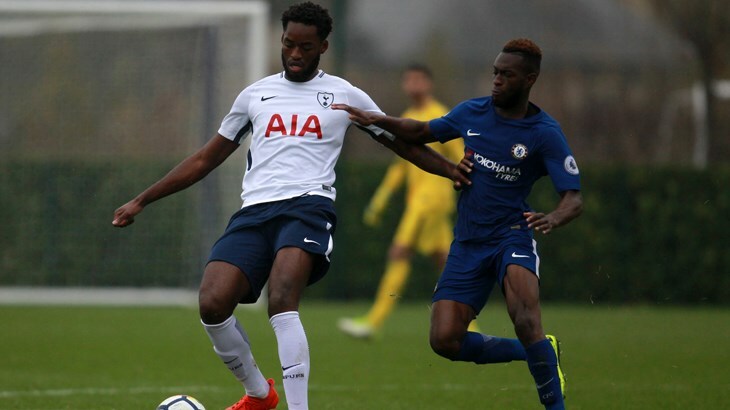 Spurs held out until ten minutes from time and conceded a fourth from the penalty spot conceded by Maghoma. Team(4-1-3-2) – Whiteman, Eyoma, C. Maghoma,Tanganga, Brown(Loft86), Skipp, Pritchard(C)(S. Shashoua 64), Marsh, Tracey(Bennetts64), Sterling, Harrison. Unused Subs – Austin, Roles. Scorers – Harrison 21, Sterling 27. Booked – Tracey 54, Skipp 73, Tanganga 79, Maghoma 89. Spurs finished the month bottom of the league. Spurs' last group game was away to Barnet on the 28th. With nothing at stake both teams played open passing football with Spurs scoring a well worked goal before mistakes in defence saw them concede twice to lose 2-1. Edwards was Spurs creator in chief and set the ball rolling laying it out to Bennetts and his cross was hit first time by Harrison for the opening goal. It all turned around early in the second half when Maghoma turn in a cross at the wrong end and Whiteman was caught in possession for his kick to be blocked into his own net. Barnet slowly closed Edwards down as they looked the most likely to score and Spurs made changes to players and formation without success. They started 3-5-2 going to 4-4-2 and finishing 4-3-3 but finished bottom of the group. Team(3-5-2) – Whiteman, Marsh, Maghoma, Tanganga(C), Eyoma, Amos(S. Shashoua 71), Edwards(Sterling 81), Roles, Harrison, Loft(Tracey 62). Unused Subs. - O'Reilly, Pritchard, Skipp.